Discussion in 'General Discussion' started by Sector3, Jan 22, 2015. My point about beta testers, yes its important to have them, but as Billy said (which i agree) in the latest video with shawn is that theres too many fanboy testers who just happy they have free content or in on it first sort of thing. Telling the devs what they want to hear just to keep them happy, and to scared of telling them whats crap. I imagine this happens in all sims! I have 300 hours in rr and I reckon 50% of that is trying to dial in the ffb and that's with asking advice here, been on this merry-go-round enough times! People not going on a forum and telling them whats wrong is why we have a ton load of problems in sims that never get fixed - ill have my say and I don't care what you think. Read it or not. - rest read below! Having said that I am not sure anyone would give a flying f**k.
Trust me I don't give a FF either! You give enough of a FF to post and give us more of your thoughts and to also emphasise you don't in fact give a FF but if needed will come back with another post should anything you say be insulted by someone who doesn't give a FF. My point about beta testers, yes its important to have them, but as Billy said (which i agree) in the latest video with shawn is that theres too many fanboy testers who just happy they have free content or in on it first sort of thing. Telling the devs what they want to hear just to keep them happy, and to scared of telling them whats crap. With RaceRoom, feedback is constantly being given back and everything is being critiqued strongly. There is a good reason why sometimes people feel new content is slow to come out - its because feedback is taken into account, improved on and repeated until its polished. I'm not sure how other games do it. Regarding Force Feedback, in my opinion, it will always be subjective. For me, it's very difficult to switch between simracing games. I cannot play 30min R3E and then 30 min AC. It just doesn't work for me. I need some time (and patience) to adapt. I had trouble setting up FFB in AC. I'm sure that if I was a bit more patient and had a bit more time that I could have tweaked it to my taste. Regarding betatesters, I think that we nearly never completely agree with the devs. We have countless discussions about specific things where every tester has his opinion. Sometimes, it slows the release of features down but it is worth the wait in most of the cases. In fact, what Andi said is completely correct. In my opinion, it would be worthless to have testers that always say yes to the devs. What's the point of having people that agree with everything without challenging it? The game wouldn't evolve! We provide another point of view of the game to the developers which is useful for them (I hope). But that's only my opinion. FFB is not only subjective, but also extremely prone to muscle memory, as long as the FFB corresponds to what is happening in the game you can learn to work with it and it will ‘feel good’ once you learn how to respond to it. Because many sims have different approaches to FFB it can be hard to move between them with the same natural feeling, which is why sims that are not your ‘main sim’ tend to feel worse whatever you do. If you put some proper time into them (and don’t use completely wrong settings) that will slowly even out. I quite liked the ACC and iracing feel so i set out to change my raceroom FFB to be closer to those and I think i was quite succesful, but there are always fundamental differences. The only area where I feel Raceroom is noticeably lacking, FFB-wise, is the road texture feel. No matter what I change, the tarmac always feels very smooth compared with AMS and RF2. Maybe the physical mesh in the tracks is less detailed in Raceroom? I don't know. In AMS I can feel the road surface in a much more direct way, which makes me feel more connected. I love it. ...except for the very vague ground effects. A more detailed road texture feel is all Raceroom is missing to complete the overall already great FFB package. My response only refers to those little spikes under the line. The rest of the time youd feel what youre supposed to feel (unless youre clipping). The only area where I feel Raceroom is noticeably lacking, FFB-wise, is the road texture feel. No matter what I change, the tarmac always feels very smooth compared with AMS and RF2.. I think that's because Raceroom doesn't add OTT road bump effects through the wheel compared to real life. With a motion rig or a haptic feedback seat, you get full road bump and surface feedback. Running the Red Bull Ring on a haptic feedback seat literally kills your ribs. I think some people feel road feel (the grainy bumps going down a straight) and think "good ffb" and then feel no road feel and think "bad ffb" even though you may be getting everything from what the car is doing. And I do get pretty much the information I need to drive the car and really enjoy how it feels... but there is a difference when comparing with RF2 or AMS with how you feel the road texture, and, in my subjective opinion, that diference favours RF2 and AMS, which to me feel more natural in that sense. 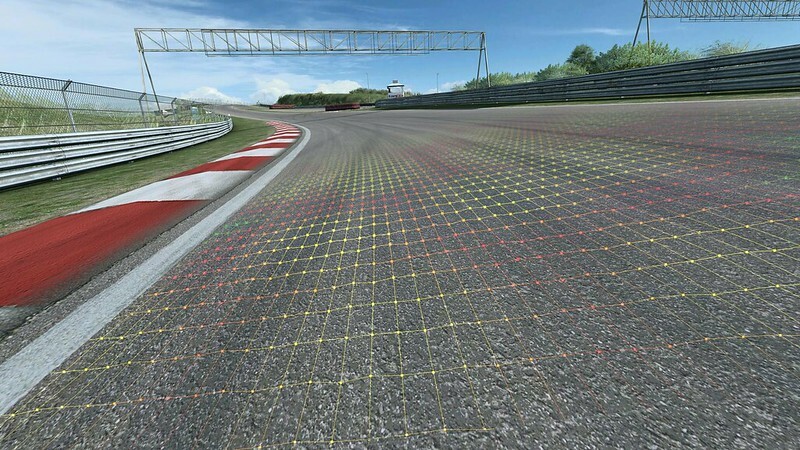 Like I said, if feels to me like Raceroom tracks might have a lower resolution/less detailed physical mesh, becouse while I do feel the bumps, the texture of the road itself feels kinda smooth... like a bumpy pool table, as opposed to bumpy tarmac.